I know that I, like, virtually never post here and that this topic could be interpreted as spammy/advert/whatever, but please, bear with me on this. I'm part of a team making a fan game based on Sonic the Hedgehog. Anyone here familiar with it (I'm assuming that's most of you) knows what the special stages are. Well, in our game, they're based entirely on NiGHTS into Dreams. Got a full working system and everything...Almost. There are 2 modes for the NiGHTS stages in our game - Sonic mode and NiD mode. Sonic mode is good and done. NiD mode is missing sprites. I've scavenged the internet as much as I can, but I can't seem to find sprites for NiGHTS stars and blue chips. I tried taking screenshots from an emulator to make it happen, but this has proved impractical. I know that a few people around here have successfully cracked NiGHTS ISOs and gotten some pretty cool stuff, and was hoping that maybe one of you guys happens to have cleanly ripped sprites from the source that I can fit into our game. Thanks a lot guys, it's greatly appreciated. I know SRB2 really well! We've actually had a topic about it earlier. 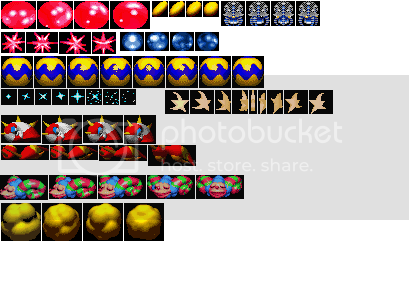 I might be able to rip the sprites using the Yabause emulator. That has a tool that lets you view the game's loaded image files directly. I'm surprised how little that game's been touched when it comes to ripping things. That's awesome, and those are great, man. Thanks a whole lot. It's greatly appreciated. I really do appreciate the offer, but at the moment we actually have what we need. Sorry. I'll let you know if anything comes up though. Do you need any backgrounds or anything else in specific? At the moment? No, but thanks for asking. The stuff in the first sheet is more than adequate and I really do appreciate it. Have to say that I'm more excited than ever to play the new Special Stages. Thank you guys for all the hard work on this game. Still one of my favorites. And Viper, you should still make a NiGHTS Wad since custom characters are supported! :L I'd love to see it one day. Correct NiGHTS mode sprites would still take hundreds of frames if you wanted to do it completely correctly. SRB2 only has one angle per Super Sonic frame, which looks weird from any perspective aside from Single Player. Ever tried multiplayer NiGHTS? Looks funky. It could still work if it was designed purely for single-player though. Would probably need the HIRES flag on though. I mean, It would be easier to just rotate a sprite than to re-draw it several dozen times. For multiplayer, I really think it would be fine just using 8 directions of a single rotation for the other player. (Like normal 3D mode super sonic's sprites) You couldn't see what angle they're flying, but it'd look better than facing the camera all the time. My point is more that NiGHTS Super Sonic is not an accurate representation of what NiGHTS sprites consist of because it's incomplete in the sense that nobody ever made angles for the directions NiGHTS Super Sonic can face. Where you're seeing just left/right, there really should actually be 8 directions. Take, for example, when you see Super Sonic going right. That is how many directions should actually be applied there. That's from a top-down view that you never see in SRB2 because it can't handle it. But we're going to say that the point at the bottom line is where the camera is. The sprites SRB2 has only have the left and right views from that point. The other 6 directions are unaccounted for and will probably never be done. A correct NiGHTS sprite would have all those directions there for each angle that you see Super Sonic flying in. There's hundreds of sprites not done. This doesn't matter if you're building the sprites primarily for single player, but if you want a true, complete set, you'd have to do that too. There isn't really a way to get around it either. The Doom engine isn't really that good at handing camera angles, anyway. The only way it could properly be done is with OpenGL mode and models. The point I meant was mostly to change the existing sprites, not do some fancy trickery by giving each angle 8 rotations.